To light the dress, I controlled the LEDs through one master panel that contained a micro controller and multiplexers and connected to each of the light module cells. One master panel contains a micro controller, battery pack, multiplexers, and a switch for restarting the dress. The micro controller sets which lights are on and off through a “game of life” algorithm running on it. It then applies those rules to the matrix of lights it is connected to through multiplexipers—which increase the number of I/O pins available. The panel also has a switch that the user can press to restart the dress at will. Along one edge of the dress runs the ground lines and, along the top, the power lines. 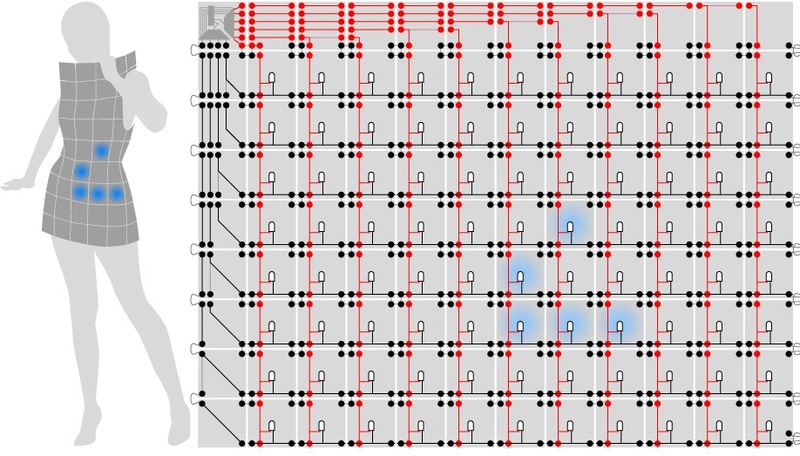 By controlling the connection of one point to ground and another for power, I can target single panels in this two dimensional array to turn on or off the lights. This edging design in copper also allows for elegant detailing. Finally, the body of the dress is composed of tiles with an LED and copper strips connecting it to the power and ground matrix.